Eclectic Paperie: Spring is in the Air ! Hi everyone! it's Toni here to share a project with you today. It surely must be Spring as the clocks go forward this weekend and our lovely tortoise has woken up from hibernation. So in celebration of things to come, I've made this flowery wall hanging. I started by painting Studio Gesso on to a chip board circle. I then used my favourite Layering Stencils, Trellis and Dot Fade, with embossing paste to add some texture to the surface. Once the embossing paste was dry I painted the frame firstly with Crushed Olive Distress Paint and then Antique Linen over the top. 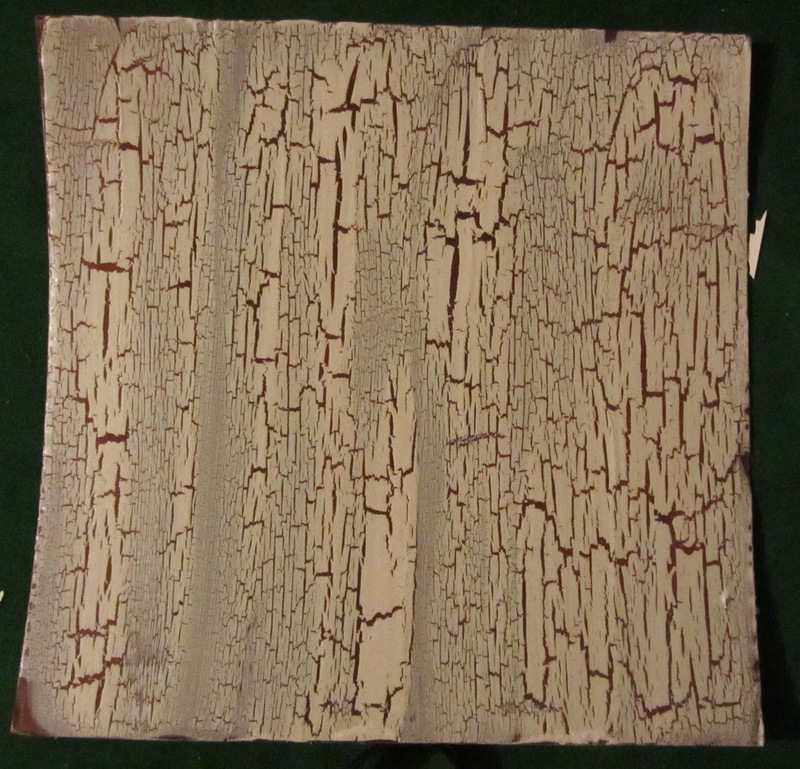 I swiped a little Walnut Stain Distress ink around the inside and outside edges when it had dried. I painted a separate piece of card for the background and used crackle medium to add interest. I really like the results of this. It's almost a shame to cover it up but I had the idea of using the new Frame Works Trellis die to create some 'rusted iron work'. I know I'm going to love using this die in projects. 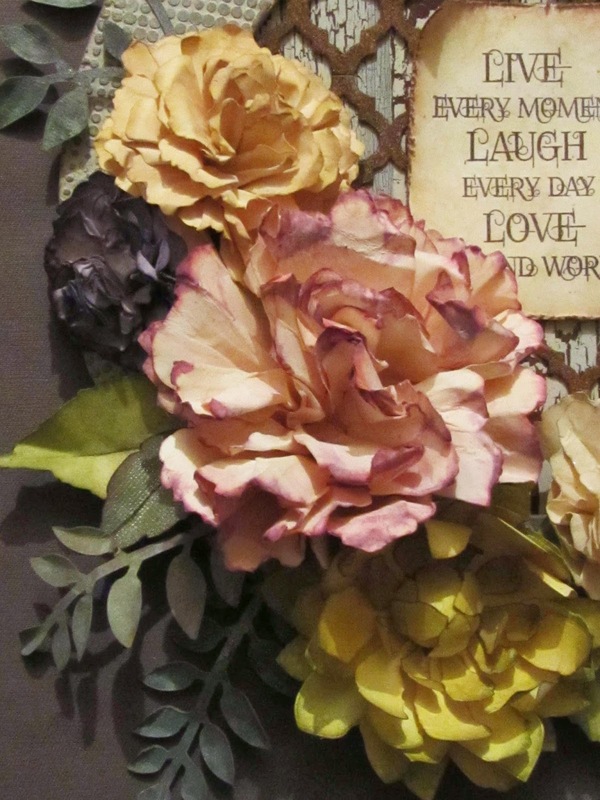 I cut several pieces and used Distress Embossing Powder in Vintage Photo to create the rusted effect. I then set to with making the flowers. 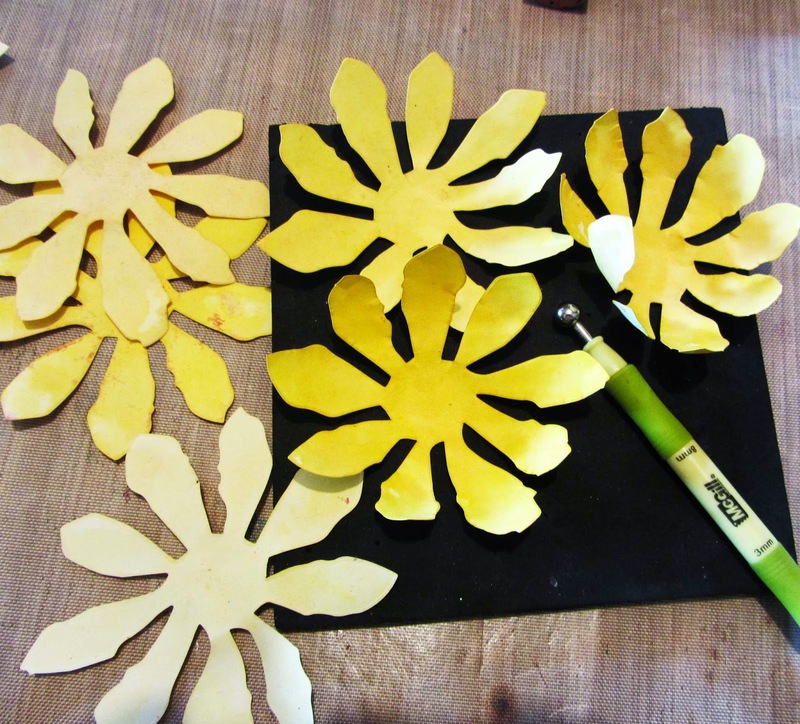 I cut several flowers in manila card, using The Jumbo Tattered Florals Die. 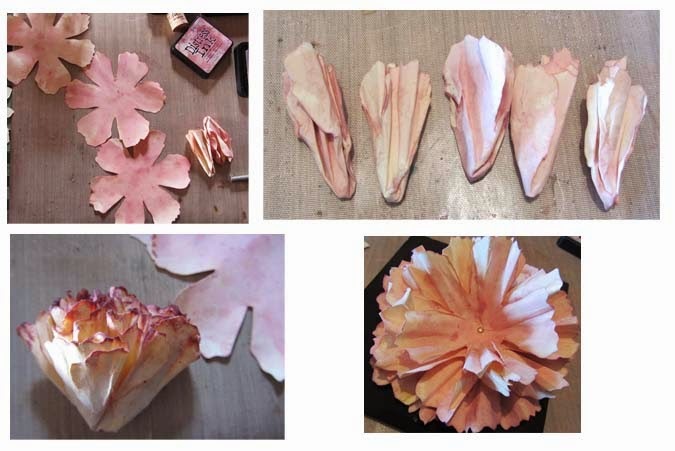 If you'd like to have a go at making flowers like these, there is a step by step tutorial, using the regular sized Tattered Florals Die, on my blog, which you can find by following this link. I used the same method with The Jumbo Tattered Florals Die for making the largest flower on this hanging. Here's a photo showing the different stages.. They're quite easy to make, and also quite addictive! 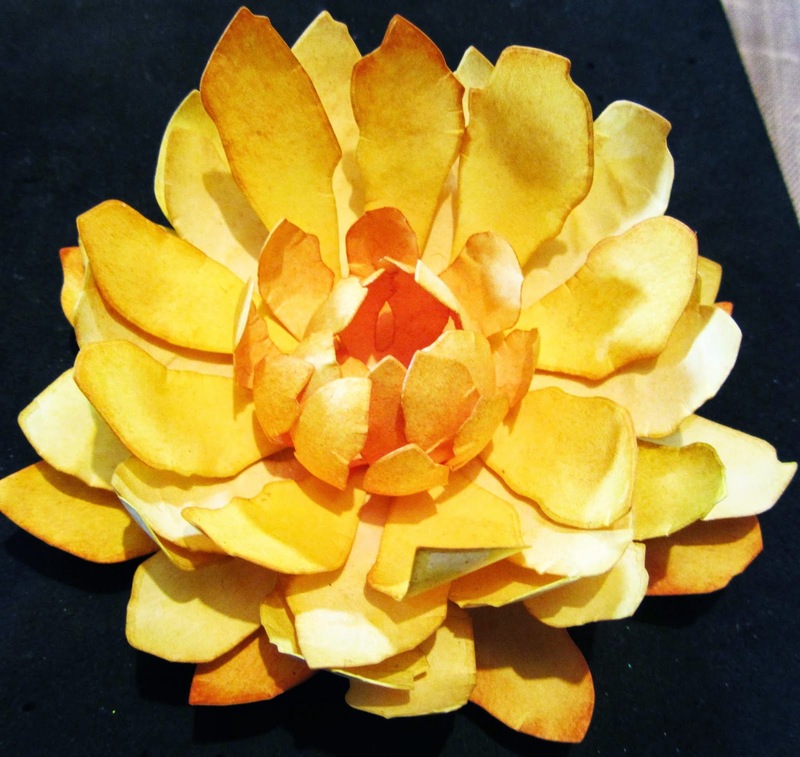 The yellow flower was made by shaping the flower petals with a ball tool on a foam mat and then layering together. I used a couple of the smaller Tattered Florals die cuts for the centre of this flower. The foliage was cut from Kraft Core card using the Tim Holtz Alterations - Bigz Garden Greens and the Alterations - Decorative Strip - Spring Greenery. I softened the surface with a little Distress paint before adhering them to the frame. I then arranged the flowers and greenery and used a glue gun to fix the flowers onto the frame. The sentiment is from a set of stamps by Indigo Blue, it's been stamped in Potting Soil Archival Ink onto a piece of distressed manila card. So, that just about finishes off my spring project. I hope it inspires you to put a spring in your step! So pretty wall hanging, Toni. Just gorgeous. Now I have to hunt up a big chipboard circle. I love it! Beautiful project Toni! Love the crackled background and the trellis die is fabulous! I love this. 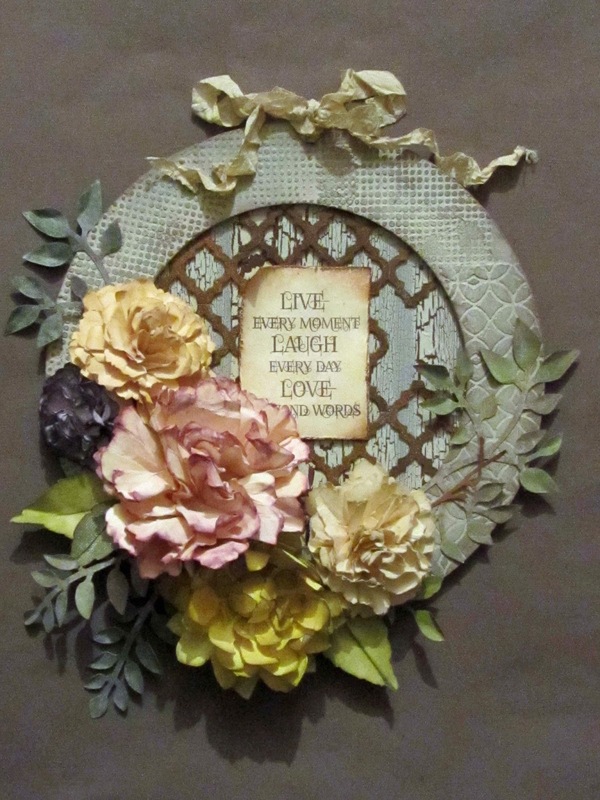 Lovely wall hanging, and I have some of the things to try and repeat. Thanks for sharing. Sitting here singing love is the air dadadadadaaadada ...... this is beeeautiful Toni, your flowers are fabulous...love your work Toni! My goodness, Toni! This is exquisite!! Toni your spring project is just awesome, fabolous and gorgeous. I just LOVE it ! And your tutorial is so easy to follow and understand. I feel so very inspired ! Thanks a lot for sharing !!!! LOVE the crackle finish and the trellis and the flowers and just EVERYTHING, Toni! FABULOUS wall hanging! Glorious flowers, Toni - and the background crackle is stunning! I see great minds think alike on rusty trellis!!! Fabulous project!